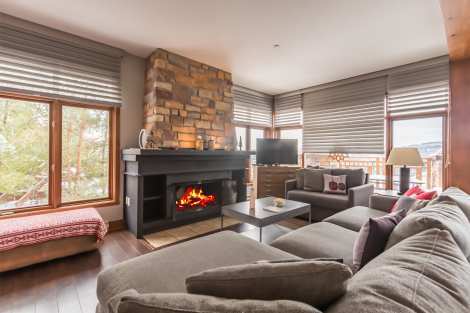 Located at the edge of Domaine de la Forêt, within a few minutes’ walk from the pedestrian village, Altitude’s spacious condos are some of the most prestigious buildings in the resort. This ski-in alpine refuge of ruggedly sophisticated wood and stone façade is a beautiful extension of its natural surroundings presenting astonishing views from its oversized windows. 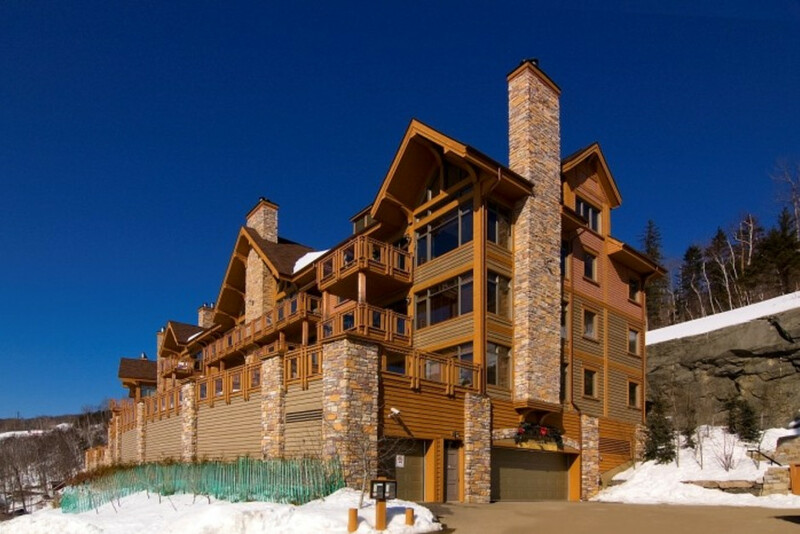 The units’ luxurious interior design, vast open living spaces, terraced decks and year-round hot tub make it one of the most distinguished mountain homes in the area. You'll love this exceptional one-bedroomproperty. 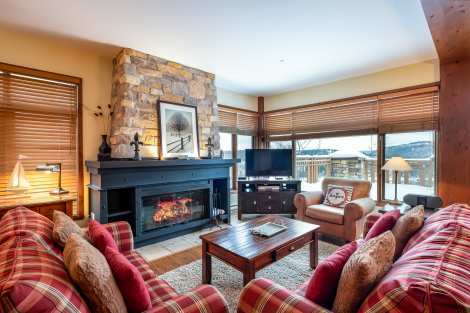 Tastefully renovated, it's the ultimate in accommodations for asuccessful vacation in Tremblant. The architecture,designed to let light in, will delight you. The private elevator, central airconditioning and heated tile floors add to the guests' comfort. The large patiowith private hot tub is a great place to unwind, summer or winter. Thewood-burning fireplace is at the centre of the open-concept main area, whichincludes the living room, kitchen and dining nook. The bedroom is furnishedwith a comfy king-size bed. Other conveniences include high-speed internet, twoHDTVs and a Blu-Ray player. Charming 1 level condo with a large terrace & PRIVATE HOT TUB, air conditioning and incredible views of the resort and the lake. Modern yet charming 1 level corner condo with a PRIVATE HOT TUB on a large terrace, air conditioning and exceptional views. Attractive corner unit on the upper floor. 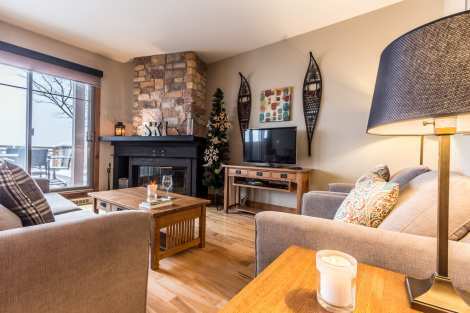 The classic-chic decor and quality furnishings convey warm and comfort. 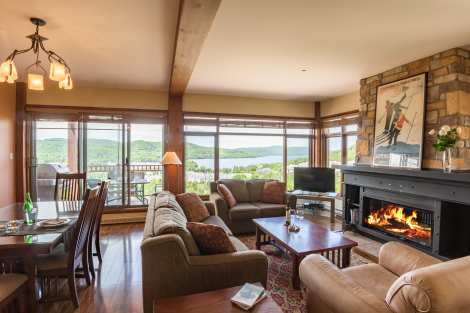 The open-concept main room offers a gorgeous panoramic view of the lake and pedestrian village. The well-equipped kitchen will inspire you to cook up a delicious evening meal.Need to relax after a day packed with winter activities? 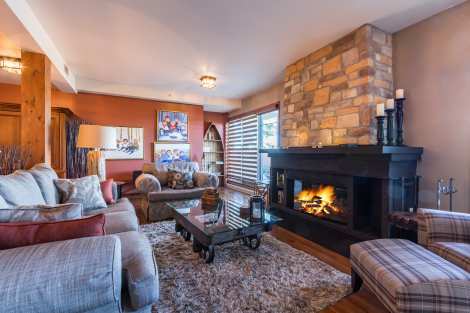 Why not unwind in front of a crackling fire in the living room? Fora good night’s rest, settle in one of the two spacious bedrooms with inviting king-size beds. The unit also has two full baths. In the summer, a balcony with BBQ lets you grill will drinking in the view. Air conditioning, three TVs and a sound system are also included for guests’ comfort. The ideal spot for a memorable stay! This two-bedroom, two-bath unit can comfortably welcome six guests. The many windows frame stunning views. 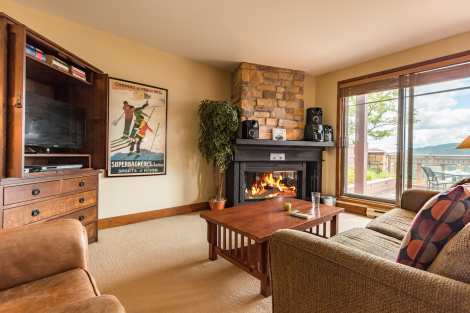 Air conditioning, heated tiles and a wood-burning fireplace ensure ultimate comfort. It is delightful to prepare a meal in the luxurious and inviting kitchen. In the living room, the cushy sofas provide enough space for everyone. 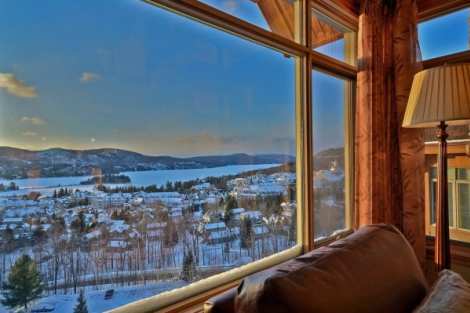 In warm weather, enjoy the deck overlooking magnificent Tremblant Lake and the pedestrian village. For a good night’s rest, the master bedroom has a king-size bed and full private bath. The second bedroom has two comfortable singles and is right next door to a second bathroom. High-speed internet, three TVs, DVD and Blu-Ray players and a compact sound system are included. You will love it so much you’ll want to come back! Gorgeous 1 level corner condo on the 2nd floor with balcony, BarBQ, air conditioning, wood floors and panoramic views. Charming 1 level corner condo with a large terrace, air conditioning and an amazing view of the lake and valley. 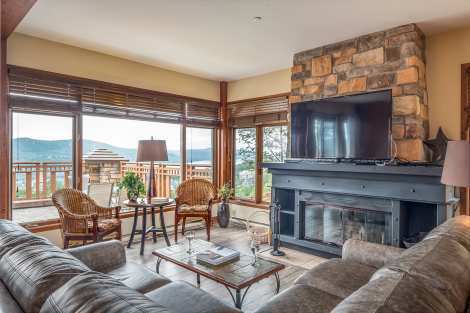 Splendid 1 level condo with an oversized terrace with PRIVATE HOT TUB, air conditioning and an unforgettable view of the valleys.